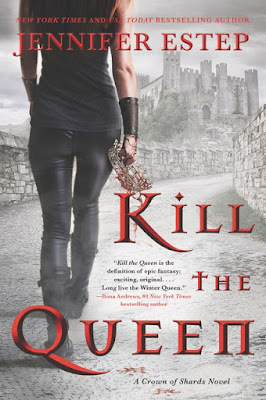 Jennifer Estep's Kill the Queen is the first installment in A Crown of Shards trilogy. Lady Everleigh Saffira Winter Blair is part of the royal family in Bellona, but she is pretty much ignored because of her status as an unwanted orphan. Her only real human contact comes from Maeven, the kitchen steward, and Alvis, Metalstone Master & royal jeweler who both took Evie under their wings when Evie arrived at Seven Spire 15 years ago. Evie has been trying to leave for months, but needs Queen Cordelia's permission in order to do so. Why should she stick around? It's not like she will become the next queen any time soon. Not when the Queen has two daughters of her own. Not when she's seventeenth in line behind a whole group of cousins. In the Kingdom of Bellona where magic is revered, Evie's lack of magical talent makes her an anomaly and brands her as practically useless. Her "mutt" magic is ridiculed and ignored. Evie is the one the Queen uses for royal stand ins at various events, learning to dance a for dignitaries, and cooking pies for visiting ambassadors. When we first meet the Evie, she has no clue that her entire life is about to be upturned, and literally thrown out the window. Thankfully for Evie, she carries a secret with her which the synopsis pretty much tells you about. So, after the Red Wedding scene in the book where Princess Vasilia viciously assassinates the queen and all others who could inherit the throne, Evie is thought to be dead. But, thanks to her mutt magic and her secret, she survive's or this wouldn't be a very long story, would it? Adhering to the Queen's last words to her, Evie attempts to join Serilda Swanson's troupe of gladiators. If she can survive the brutal training, and her fellow gladiators, (including Paloma & Lucas Sullivan), who would stab you in the back in a moments notice, then she can work out a way to gain her revenge against the person who tried to kill her. Surprising enough, Evie makes friends with not only Paloma, but Lucas as well. As Evie learns who she really is, not just a cast off orphan with no future, she just may be someone who can take revenge on the person who tried to kill her. In this story, there's plenty of action, and the authors signature blood bath. Fairness in review writing. No, I have not watched Game of Thrones, but I asked my mom who has, especially the Red Wedding episode. There is a slow burn romance in this book, and that character has plenty of his own secrets that will need to be explored before this series sails into the sunrise. I loved the relationship between Evie and Paloma, a sort of shape-shifter called morph. I also like Xenia, although it took events in the second half of the book for me to warm up to her. Recommendation: High. I am one who gobbles up Jennifer's books like I was eating red velvet cake. I can't resist. She offers action, adventure, a bit of romance, and a bit of humor mixed in. Hi, I'm Shelley, an avid book reader from Florida by way of New York. I read and review books of MOST GENRE's for my own personal gratification and don't mind if people disagree with my assessment as long as they respect me. I love receiving book recommendations from my friends, and authors, and appreciate when I'm lucky enough to receive an ARC before release. I consider myself lucky enough that people actually stop by and read my reviews. Header Designed by Nocturne Romance Reads. Awesome Inc. theme. Theme images by molotovcoketail. Powered by Blogger.